Inspiration can often come from strange places. For UK ready meals boss Charlie Bigham it was being unable to sleep at the border between Iran and Pakistan. Mr Bigham was 28 years old at the time, and he and his then girlfriend were travelling from the UK to India by camper van. "It was very, very hot, and we were in a really tough place," he says. "I couldn't sleep, so I just laid there restlessly thinking about what I was going to do for a living when we got back home. "I decided there and then that I was going to set up a food business, and it was going to look a bit like this." Mr Bigham had previously worked as a management consultant in London, before he and his girlfriend quit their jobs to go travelling for nine months. 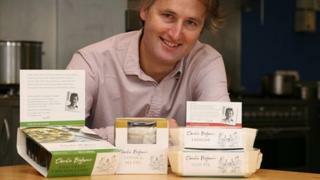 His ambition was to set up his own company when they returned to the UK, and now he had his idea - he was going to establish a business that made upmarket ready meals. Mr Bigham was not going to let the fact that he had never worked in the food industry before put him off, and instead he decided he would quickly set about gaining the knowledge and skills he needed. And so upon his return to the UK he got a job at a delicatessen in London's fashionable Notting Hill area. "I've always been really interested in food, but I had no food industry experience, so I knew I had to get some cheese under my fingernails, so to speak," he says. He ended up spending almost four months at the deli, and at the same time did lots of research, and working on recipes. "It became clear that the idea of making meals which are then sold via shops was a very good idea for a business because it was a massive market, yet one which was very straightforward to start up in," says Mr Bigham. "I knew we could start under the radar before any bigger rivals could crush us, and then build quite quickly." In November 1996, 11 months after his return from travelling, and now married to his girlfriend, Mr Bigham launched the business with £25,000 of savings, calling it simply "Charlie Bigham's". To begin with, it was just him and one chef based at a small facility in London's Park Royal business estate. Mr Bigham says: "We had just three product lines to start with - zesty Caribbean lamb, Cajun chicken with salsa, and salmon with a dill and cream sauce. I think we made just 20 meals in total in that first week." To get sales moving, Mr Bigham, now 47, says he simply started "knocking on people's doors". "I went round all the posh delis in London, and the big department stores with food halls. Everyone was approachable, and said, 'Yeah we'll give you a go'. "I just had to be mildly persuasive, and I'm not a salesman. "What greatly helped us, is that you have to remember that at the time, most ready - or convenience - meals, as I prefer to call them, were pretty dreadful. "We were one of the first to make quality ones without anything artificial. This set us apart and made shops interested in stocking us." But while selling to posh stores in London was pleasing, Mr Bigham realised that in order to grow the business he needed to win a contract with one of the UK's supermarket groups. And so he cold-called Waitrose. "I just picked up the phone and rang the Waitrose switchboard. I managed to persuade a lovely woman on the phone to put me through to a buyer. I got a meeting, and the buyer said she would give us a go." Charlie Bigham's meals have been stocked by Waitrose ever since, initially at 40 stores for a successful trial period, and then nationwide. Online supermarket Ocado, and Booths, the north of England supermarket chain, have since followed suit. The company now employs 200 people across two sites at the Park Royal business park, and has an annual turnover of £20m, which is now growing at 19% per annum. Mr Bigham says his former job as a management consultant helped him manage the company's growth over the past 17 years. But he is the first to admit that luck and good timing played a major role in his success. "The only way you can ever set up a successful business is to be lucky," he says. "It is the thing you need more than anything else. Anyone who says otherwise is just lying." Mr Bigham says that most important piece of luck was all to do with timing. "I set up a food business just as interest in food was blossoming in this country. Suddenly there was a wealth of TV chefs, and the national newspapers all added food sections at weekends. "And the supermarkets were all being brave and looking outwards towards new suppliers. There was no planning or forethought about all this on my part, it was pure luck." Mr Bigham today gives himself the job title "chairman and creative director". This followed his decision back in 2010 to bring in someone else to handle the chief executive role. "It has enabled me to focus on the bits of the business I'm really interested in - product development, and the big strategic picture - working out plans for the next three to five years," he says. "The bit in the middle [the day-to-day financial decisions etc] I'm easily bored by, and is best done by someone else." Looking ahead, Mr Bigham says the company has no plans to start exporting, because the freshness, and therefore limited shelf life of his products, makes it too expensive. Nor does he ever intend to move production away from London to somewhere cheaper, because he says he is loyal to his hard-working staff. "I'm proud of what we have done to date, but I'm in no way complacent. Owning your own business is a hugely privileged position to be in, because I work with people I have chosen - not many people can say that."